I’m working on a project right now in healthcare. I’m swimming in 10 years of claims data. Millions of rows, all with more variables than I can count. I wanted to know which states are using ICD9 codes, which ones are on ICD10, or CPT, or HCP – and when did they switch. I felt like I was back in kindergarten. One of these things is not like the other, one of these things is different. Which one is different? Well, my data set was so large I have no idea! I developed a workflow that would mine the data. It matched the raw codes with their category, and then told me the frequency of that type of code in the data. For each state I put millions of individual claims through the model. In less than one day, I had a neat table that told me the frequencies of each code. I had the data we needed to move forward. My boss looked at me in awe. The amount of data that I crunched through in a short period was truly stunning. I had the data at my fingertips to answer any question he had about our project. Alteryx allows me to quickly find the insights that we need. Alteryx accelerates my process. Do it once and be done! For a previous employer, I had a monthly reporting package I ran in Alteryx. My workflows, though very sophisticated, were well documented. When I was getting ready to leave, I handed over my workflows to my boss. Thank goodness my boss was a heavy Alteryx user. About two months after I left, we got together for lunch. He was amazed that he had done all my monthly reporting. Given the complexity of what I was doing, he was impressed that he could produce those results with my workflows. 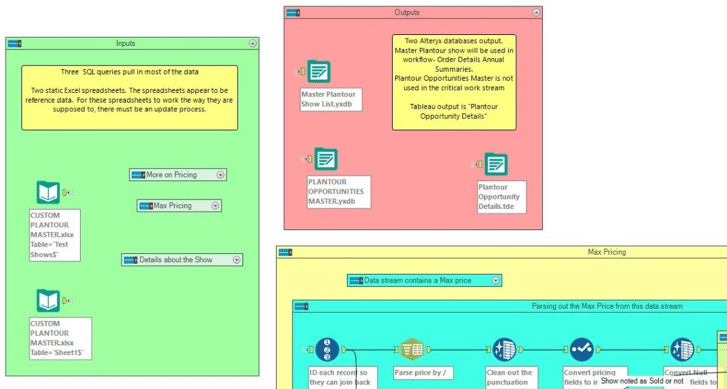 But that’s the beauty of Alteryx. Once a workflow is built, the genius is encoded within. I can leave behind very complicated workflows that will continue to produce insights. I don’t have to be there ensure that they get their insights. I helped a client get a holistic view of what was happening, regardless of which division did what. 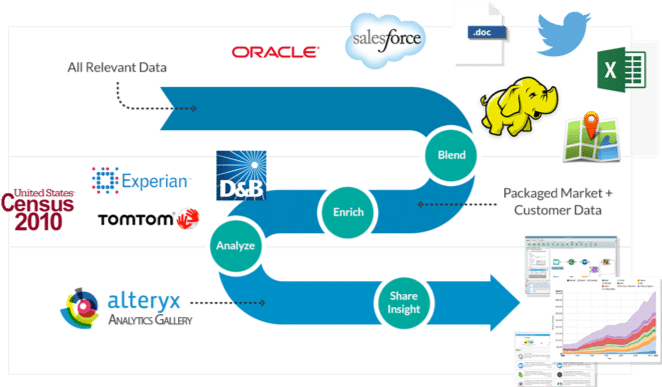 Using Alteryx, I could reach into the data warehouses, SQL servers, and Salesforce. I could reach in and pull out the raw data to create the KPIs. Each month I had to gather the same data from various SQL servers. The KPIs were created once I had all the data in one place. Legacy systems meant that certain data points weren’t housed together. My workflows allowed me to reach into different data warehouses and extract the data that I needed. The data was then pushed to Tableau for consumption. All the heavy lifting was done in Alteryx. I was shaping the data, labeling things. Year-over-year, historical benchmarks were created. I created baselines and annotated the data so that it looked pretty in Tableau. Alteryx enables me to pull together disparate data sources. I can also cleanse, prep, and transform the data. With Alteryx, I’m able to do enough geospatial analytics to get myself in trouble. It’s just so easy with Alteryx. Drawing trade areas, and pulling the demographics is simple work in Alteryx. I never thought I would produce maps, integrating data. I volunteer with a local Alteryx for Good Partner, the Commit Partnership. Using their datasets, we are modeling kids standardized test scores. The raw data is very sparse. It’s hard to figure out what’s driving their test scores. We needed to enrich the raw data. Commit has the Alteryx Data package, and we were able to draw trade areas around each school. Using the demographic package, we pulled in socioeconomic variables, things about school funding, and so much more! As an economist, I would kill for this data! (Actually, my classmates have tried to bribe me into giving them data!) With Alteryx’s data package, I can enrich just about any data set with local, accurate data. I can understand the population around a school, in detail. And we will be able to say what impacts kids’ education here in Texas. For a previous employer, each month I got data that had columns that really didn’t matter to me. I couldn’t care less that this interview was number 1034. My data came in with blank fields, and concatenated values. I needed to parse out the data I needed, and some how impute the values that weren’t there. Messy and dirty data is a reality that we live with. The data cleansing tools within Alteryx are robust. Of course, now I’m a biased audience. Recently the Unique tool became my current favorite! While cleansing medical claims data, this tool got used, and re-used. I needed to know how many times codes appeared in the data. Once I had a code counted, the fact that it appeared in other fields was irrelevant it was counted! The unique tool allowed me to check, and double-check, and triple-check my data. 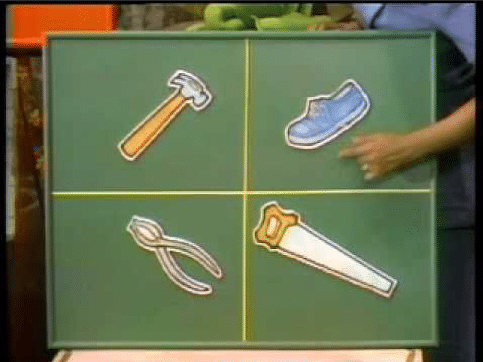 I may be a little OCD, but we’re not going to talk about that here!